Essential Qualification and Experience – BHMS (Bachelor of Homeopathic Medicine & Surgery) from Government recognized Hospital/ Institute / Organization with sufficient clinical experience. Desired Qualification & Experience : Desirable MD (Homeopathy) [ Doctor of Medicine in Homeopathy] from a recognized Institute in India and / or at least 1 year experience of serving in a Govt. hospital / higher educational Institution dealing with students. Duration of duties shall be not less than 6 hours per week. The engagement for the above will be initially for a period of one year. However, based on satisfactory performance and necessity of the Institute, it is likely to be extended for further period. 1. Candidates should have working knowledge in usin g computer systems for information processing and retrieval. 2. 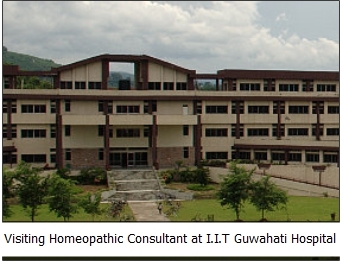 Duties will be as assigned by the CMO( SAG) & HO S, Medical Section, IIT Guwahati. 3. The candidate must be a citizen of India. 4. Degrees as referred above are those which have been awarded by a recognized Institution. 5 .The Institute also reserves the right of rejecting any or all the applications without assigning any reasons thereof. Decision of the Institute will be fin al and binding in this regard. 6 . Any dispute with rega rd to the selection/recruitment process will be sub ject to Courts/Tribunals having jurisdiction over Guwahati. 7 . Canvassing in any form/bringing in any influence political or otherwise will be treated as a disqualification for the post. “ INTERIM ENQUIRY WILL NOT BE ENTERTAINED ”. 8. Reservation, wherever applicable, will be as per GO I rules. 10. No TA/DA will be paid to the candidates for appearing the interview.